You can change the size of the text displayed in all Portfolio and Watchlist tables via the Preferences window, in the “Visuals” tab. Use the “Font size” selector to choose how large you would like the text to be. 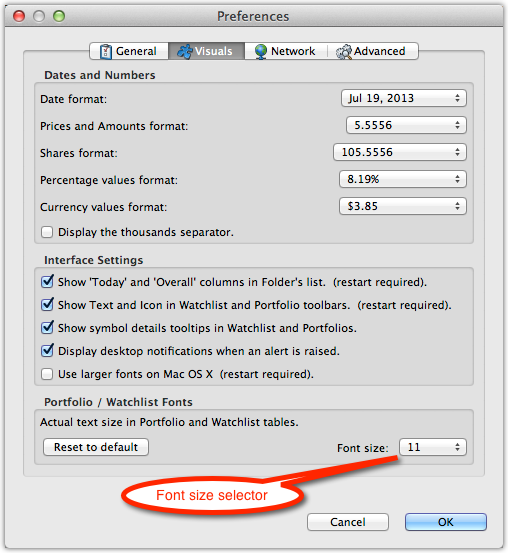 The text, “Actual text size in Portfolio and Watchlist tables,” will change size to match the chosen font size. To go back to the default text size, click on the “Reset to default” button. To apply the text size to all Portfolio and Watchlist tables, click on the Preference’s OK button. Changing from a larger text size to a smaller text size can sometimes cause the spacing of items in the tables to be inconsistent. If this happens to you, restart StockMarketEye to correct the spacing.